If you’re looking for the services of a premium commercial electrician, Richmond locals can rely on the top-quality services of E J Lack Electrical! Based in Hawthorne, we’ve been servicing the Melbourne community since 1963 – and in that time, we’ve helped thousands of our clients with all their electrical problems. We are one of the most trusted electricians in Richmond, so you can count on us! Maintenance, repair, service… no matter the job, you can be certain that we’ll do it all to our same standard of absolute perfection with zero compromise. You can expect the friendliest service with highly detailed and efficient workmanship. For the best Electricians Richmond has to offer, contact E J Lack Electrical today! For premium electrical contractors, Richmond locals needn’t look further than E J Lack Electrical. Covering both residential and commercial properties, we’ll expertly handle any task that comes our way – from switchboard upgrades to security lighting, wiring (and re-wiring) homes, safety switches, audio/video intercom systems, installation/replacement of dimmers, wired smoke detectors, you can be sure our professional electrical contractors will service your Richmond property with top-quality products to leave you completely satisfied with our services. We’ll even clean up any mess after we’ve finished so you can be left to enjoy your new electrical fittings. Do you need qualified and trustworthy electrical contractors in Richmond? Call us today. 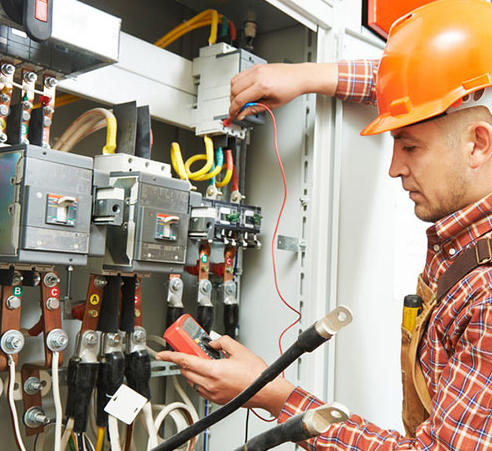 Are you looking for a competent commercial electrician in Richmond? You can’t go when you choose E J Lack Electrical. Our team of highly trained electrical professionals make sure to not cut corners when working on commercial projects. Your safety is our priority, so we’ll do everything we can to keep you and your family safe from any electrical hazards. Our workmanship is unrivalled; we’ll do the job right the first time without the need to come back and fix up a shoddy job. If you are after a commercial electrician in the Richmond area that will deliver top-quality workmanship and service – you’ve come to the right place! At E J Lack Electrical, we believe in the quality of our services so much that we even offer a 12-month labour warranty! Furthermore, we’re respectful of your time – if you call us, we’ll call back ASAP. The best commercial electricians in Richmond can be found at E J Lack Electrical, contact us today to make an appointment. If you need an accredited master electrician, Richmond property owners can call E J Lack Electrical today on (03) 9853 2644. E J Lack provides quality services Data Cabling, Emergency Light, Exit Lighting, House Wiring, LED Downlight and Switchboard Upgrade through their experienced electricians in Kew, Camberwell, Malevern, Balwyn, Canterbury, Alphington, Ivanhoe, Toorak, Richmond, Mont Albert and Brighton.